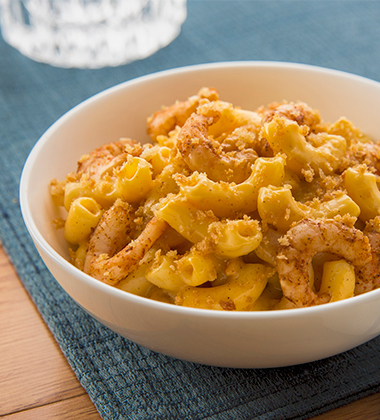 Perfectly seasoned Cajun style shrimp and Campbell's Mac & Cheese and topped with panko bread crumbs and green onion. This creamy Mac & Cheese is perfect as an entrée or side dish and delivers a classic cheddar flavor your patrons are sure to love. 1. Thaw Campbells® Signature Macaroni and Cheese according to package directions. CCP: Hold for cold service at 41°F until needed. Cajun seasoning	 4 1/2 tsp. 2. Spray oven-proof casserole dish with vegetable cooking spray. Reserve. 3. 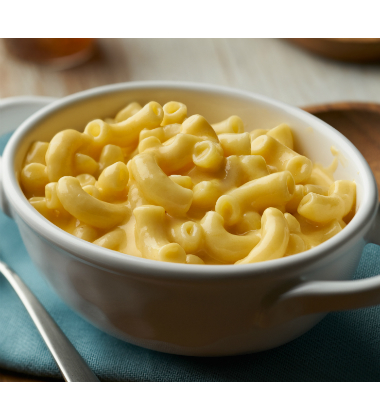 Place thawed macaroni and cheese in greased oven-proof casserole dish. 4. In medium bowl, toss shrimp and Cajun seasoning. Place on top of macaroni and cheese. Reserve. panko	 2 oz. 10 tbsp. butter, melted	 1 oz. 5 tsp. 1. In medium bowl, mix panko and melted butter. Sprinkle panko evenly over top of shrimp in filled casserole dish. 2. Bake for 30 minutes, or until golden brown. 1. Using 1- #8 scoop, portion 1/2 cup (about 4 oz..) into bowl. Serve immediately. panko	 1.5 oz. 10 tbsp. butter	 0.75 oz. 5 tsp. For extra heat, mix hot sauce into mac & cheese mixture.